thyssenkrupp has announced that they will be producing cold-rolled grain oriented (CRGO) electrical steel from cold rolling for the first time in India. The company is the only manufactured of CRGO in the country presently. With this development, the company’s Nashik plant output capacity will increase to 35,000 MT per year. Globally, only a few companies have the capability to produce CRGO and the technology is not easily available for assimilation. thyssenkrupp will use its global technology and the know-how to produce CRGO locally making them the only manufacturer to offer the complete range of Grain Oriented Steel (GO) in the country. This increase in capacity will help in meeting the continuously growing demand of CRGO in the Indian market. 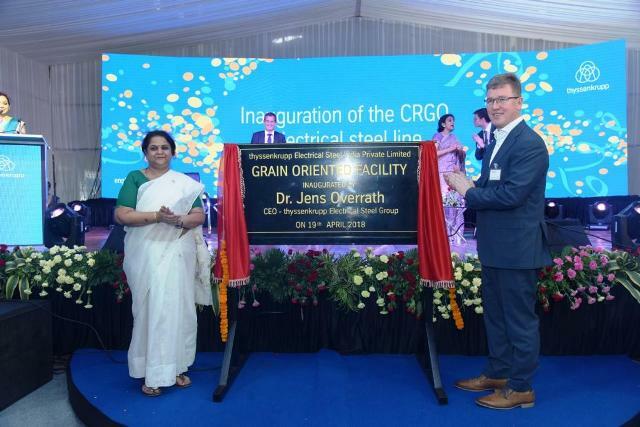 Speaking on the occasion, Dr. Jens Overrath, Chairman of the Executive Board, thyssenkrupp Electrical Steel, said, “India is a very important market for us and we are the only manufacturers of CRGO steel in the country. The expansion will enable us to enhance the innovative approach that we take towards all our products, thereby providing cutting edge technology to all our offerings”. “We are pleased to expand our current capacity at our production plant in Nashik. The demand for this product is expected to rise exponentially in the coming years with additional thrust on the power sector in the country. Currently, no other company manufactures CRGO grade steel in India due to its technologically specialised nature. We believe this additional capacity will aid in the achievements of the targets set for the power and transmission sector in the country”, said Kesava Iyer Venkatesan, Managing Director, thyssenkrupp Electrical Steel India.